[uds-billboard name=”juan”]The 1954 Pruitt-Igoe housing project was an architectural and social disaster of such tragic proportions that it marked the point at which some claim Modern theory and architecture came to an end. Thirty-three eleven-story buildings in Saint Louis’s lower North side were believed to be the solution to deteriorating slums to the north and south. Poor city planning and the residents’ low income created a perfect storm of crime, poverty and segregation which thrived until the Pruitt-Igoe housing project became unlivable. The buildings were demolished starting in 1972, and all that remains today is over fifty acres of fenced-off overgrown wildlife. I talked with artist Juan William Chávez about his less damning outlook on the history and fate of the Pruitt-Igoe site. In this interview we discuss his proposal for a Pruitt-Igoe bee sanctuary in a community-built park as well as the unique studio process that led him there. 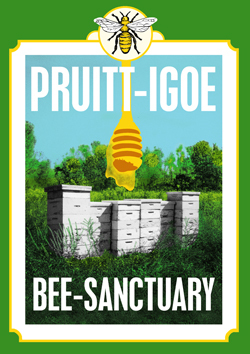 Marie Heilich: The website for the Pruit-Igoe Bee Sanctuary will be launched soon. How will it function within the project? Juan William Chávez: I was invited to give a presentation on the opening night of Open/Closed (a weekend workshop on vacant lots in Saint Louis.) The producer of the documentary The Pruitt-Igoe Myth gave a talk and I opened for him. That was the first time I talked publicly about my project so I wanted to at least have the intro page of the website up and running. At the same time, while I’ve been collecting data, such as interviews about Pruitt-Igoe and beekeeping, I setup a Facebook page. Surprisingly, I’m glad that I did that, rather than getting into the website right away because now I understand how the website can function better. It’s going to be an archive of conversations, images, and information about the Pruitt-Igoe bee sanctuary that I’m proposing to the city. The web site should be up and running in early June. MH: What’s your basic outlook on the issues surrounding the past and future of Pruitt-Igoe? JWC: The thing that interests me about Pruitt-Igoe is the cross-pollinated demographic it attracts. There is more than one audience that’s interested in Pruitt-Igoe; it attracts architects, social workers, urban planners, artists, civic workers, and the tenants that lived there. There are so many people that have a relationship with the space and the people involved in Pruitt-Igoe. For me, it has been truly interesting to tap into the cross-pollination of different perspectives. The other part I want to concentrate on is the continuation of the conversation surrounding Pruitt-Igoe rather than talking about what’s already been said. I want to avoid talking about the idea of Modern architecture, or talking about the devastation, the crime — I’ll pay homage to that through the interviews because it’s going to come up, but I’m not going to focus on it. I’d like to move on and look at how we can take the energy that’s already there and reroute it in a different direction. Pruitt-Igoe was an unnatural environment that didn’t work, so finding a creative solution that can naturally exist in the new environment will close the history books on a positive note rather than building a strip mall on top of it — then we’re locked in and will go down in history as just a horrible example of public housing in St. Louis. One of the problems is that it is a piece of hot real-estate and investors are just waiting for the right time to buy it and develop it, which is uninteresting. There are vacant condos on Washington Ave– why build more stuff? There are tons of buildings that are vacant and difficult to rent. No one’s moving to the city to “live in luxury,” so it seems like a lame idea. What people concentrate on is the negative aura Pruitt-Igoe has around it, so it’s treated with shame. People have the attitude that it should just be built on top of to get rid of it. But by confronting history you can start seeing the possibilities. Pruitt-Igoe is not just saying, “we messed up,” but it’s possible to take this history and change it. It’s still not over. Pruitt-Igoe is still active, but once it’s built on, it’s done. To me the history book is still open and we can redirect history. If it were a bee sanctuary that offered educational programs and a memorial park filled with wild plants, a destination for people to go–that would stimulate the environment far more than a strip mall or an apartment complex. A unique plan like that would get far more attention and could inspire the city more than anything else. When I ran Boots I would always get emails from artists and students from overseas wanting to come to St. Louis so they could visit Pruitt-Igoe. The idea that people would be able to go there and actually see part of the remaining history is in demand and can be cultivated. Not to be too romantic, but it would be taking something that’s a minus and turning it into a plus. Not only would the City of Saint Louis no longer have this as a taboo but it would become something to celebrate. MH:Have you been thinking about doing a project with Pruitt-Igoe for a while now? JWC: I’ve been working on the project for about a year and a half…I started January 2010. But before that, the way I thought about Pruitt-Igoe was distorted. As I said before, when I ran Boots a lot of artists emailed me wanting to do something involving Pruitt-Igoe and my response was that it was gone, you can’t see it, and it’s been built on top of. I knew about Pruitt-Igoe and its famous role in the “death of Modern architecture.” What I didn’t realize was that I had my projects confused. There was a project over by Anheuser-Busch called Darst-Webbe and that is the one I saw when I was a kid that was torn down. I always thought that was Pruitt-Igoe. 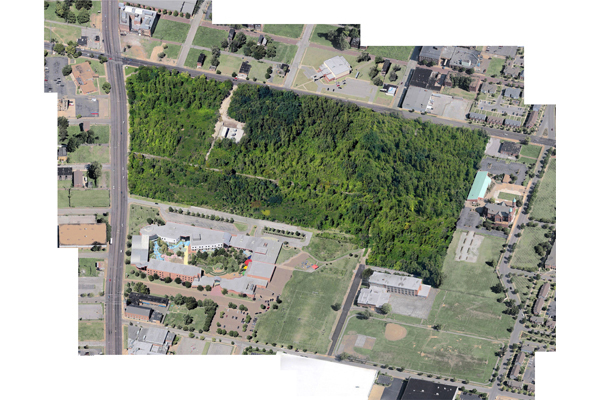 It wasn’t until I was involved with a North Side community project and I kept driving by this huge tree-filled lot and kept thinking “what is this weird fenced off lot in the middle of a major avenue?” I thought perhaps it was once a lumberyard or junkyard. It wasn’t until someone told me that was the location of Pruitt-Igoe that my world was rocked big time. I got really upset with myself because for the last four and a half years I was telling artists that it was no longer here. Through my own mistake of not knowing about it I wanted to know as much as I could, so I just started researching the hell out of it. Through my research I realized how big it was. When I went to school in Chicago my bus route would pass by Cabrini–Green, there were 6 or 7 buildings, so when I found out Pruitt-Igoe had 33 buildings I was blown away. In pictures you really only see one building collapsing, you never really see the epic mass of it. MH: The piece you included in the Sweet Jesus show last November included images of Pruitt-Igoe and actual bee hives in the space. Was that the starting point for the proposal? JWC: I started doing studio research on the site and at the same time I was learning about film and photography. The interesting thing about film is that you have to pay attention to the light. I started driving there in the morning and in the afternoon and at dusk to see how the light changed. When you do that you’re not just going in there with a digital camera, shooting rapidly and walking out with 200 images. When you shoot with film you might get 12 successful images. It slowed me down and I was able to spend some time in there and ask questions. So the first thing I wanted to do was get images. The name of the series was 33 Buildings 11 Story. Going back to the idea of continuing the history of Pruitt-Igoe, there’s been enough art made about the destruction of the buildings. I wanted to do the opposite by taking photographs of the site in it current state. I would show people these photographs and ask them where do you think I shot these pictures? Most would say a rain forest or even some other-worldly place. During one of my film shoots, there were so many bugs you couldn’t hear the traffic. I was there at like 7 in the morning the birds and bugs were just going crazy. I also noticed many dog paw prints in the dirt. It made me realize that the site had become a natural habitat. So at first, I was thinking bird sanctuary, wild dog park, something ludicrous. I started asking people “what would you do?” That’s just the nature of brainstorming– you have to get the goofy impulses out first just to clear your mind. It wasn’t until I was taking a picture of a wildflower and I saw a bee that I thought, well bees are a community and they could use a sanctuary. That was a big part of the studio research. I didn’t go in having a big idea; I went in there in some ways just wanting to correct my ignorance by doing studio research. I started researching bees and right away I wanted to own a Bee hive. That was a search in itself. I wanted ones that were functioning already and I was able to find them. Actually when I had them in my car there would be bees all over the place. I guess they were drawn to the pheromones in the used hives. Hunting down the hives was interesting because also through studio research you meet people. So now I’m talking to a farmer out in the county and talking to a farmer out in Illinois and I’m going to their farms and seeing how they use bees and how they talk about bee keeping. Then I went to my studio and started to stack the hives. Then I pushed one back and it was right in front of me. There are the Pruitt-Igoe buildings. It was one of those moments where I was really trying to keep my mind open about the project and the project came to me. Those are moments that I love. They don’t have an agenda or anything. There’s a poetic part of it being a bee sanctuary too. Bees are dying and bees help sustain the human food chain. Bees equal humans in that way. Without bees we would have a very hard time getting food. Not to get too into the bee thing but just skimming the top of my research, any type of fruit or vegetable that we eat, without bees, we wouldn’t have it. And if you say “well I eat meat,” cows eat food pollinated by bees. It’s not just a vegetable and fruit thing but it’s who’s eating that food, too. MH: Even if science were to recreate the act of pollination, I couldn’t imagine it being as effective or sustainable — which relates to the way Pruitt-Igoe was a temporary solution to a much more complex problem and therefore destined to fail. JWC: Right. What made the bee idea come full circle was when the new census was released saying that the Saint Louis population is declining. So there’s also that parallel relationship. Pruitt-Igoe, where there was a failure of a community, will take new communities to get it off the ground. Anyway, to answer the Sweet Jesus question, that installation was the end result of all the studio research. The film was all the plant life. After I got all the bee hives I actually went to the site and made the sculpture at Pruitt-Igoe and shot some super 8mm film. The piece in Sweet Jesus was showing all these parts, test driving it. What was really cool about Sweet Jesus was that we had the freedom of test-driving work to see how audiences reacted to it. MH: How did your studio process evolve into the public proposal? JWC: Well another thing that happened at Sweet Jesus was everyone that saw the piece came to me and started telling me a story about how they were connected to Pruitt-Igoe. That’s when the need to do more came about. The film screams exhibition but for me it’s not about an exhibition: this is about an investigation that uses art to contribute to a public dialogue. So how do you do that? Well the public has access to the internet, so that’s where the website comes in. Through the studio process all these happy little things happened. At first it was a conceptual proposal, then when it actually began triggering responses — some of the responses came from people just wanting to tell me more about their relationship to Pruitt-Igoe or even the response from the bees coming to the hives. In the end it was the public that triggered the proposal. MH: Since running Boots have you seen an evolution in your practice as a whole? JWC: Boots was more of an artist type sanctuary. I’m more interested in culture now. I’ve always been interested in culture, but as an artist I’m evolving to the next step. The art community is a safe haven that I can always go to but for me the real action is outside that sanctuary. MH: Describe your proposal for the future of the Pruitt-Igoe site. JWC: The proposal is a living thing. 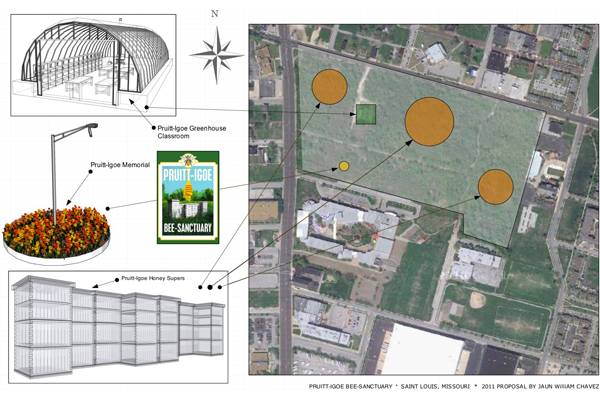 The end goal would be to have a bee sanctuary/memorial garden on the site that addresses the history of Pruitt-Igoe by incorporating education through bee keeping. The environment is perfect for art and mentorship programs. It can be a place to learn about Missouri wildflowers or even a day where you could go see the harvest of the honey. There’s a beauty in a slow production– you take one step one year, you reevaluate, and you take another step. You don’t have to build this thing overnight and this developmental process will create more opportunities and more hype for this type of park. I was just awarded an Art Matters grant to conduct studio research in Paris, France where they have the oldest beekeeping school in the world in a park called the Luxembourg Garden. Paris is a really good example of urban beekeeping and is successful with it in a city environment. It makes sense. Bees are like a maintenance crew, they naturally help sustain the park. I’m going there to study this example of beekeeping and education in a park setting and to see how it functions. This model is sustainable and is seen throughout the world. That’s why I believe the Pruitt-Igoe bee sanctuary would be totally cost-effective. The maintenance of the park and the development of the park would be a community project. Having a day of trash pick-up could be an amazing public event. Using plants that naturally exist, not trying to create a Climatron, but creating a natural habitat. It’s a far more cost-effective project than spending millions of dollars on construction, which could end in the same fate of being torn down. There needs to be something unique that happens. This is a wonderful interview with an inspiring artist, Juan William Chavez. I had the pleasure (and honor) of working alongside him in the Regional Art Commission’s Community Art Training (CAT) Fellowship this past year. He knows how to mine gold from the bare earth to create works of beauty and intelligence. I can’t wait to see his film and exhibition!